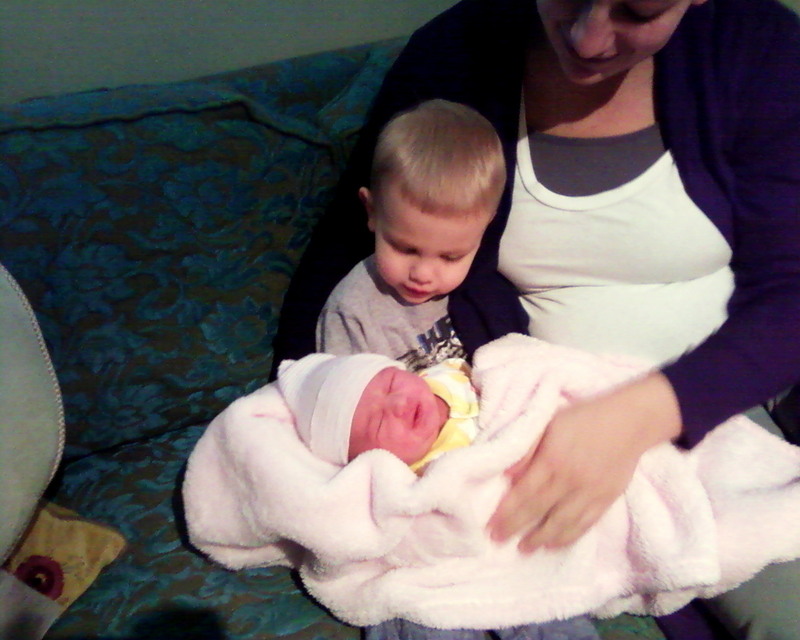 Lincoln holding his baby sister for the very first time. Getting acquainted with baby sister. 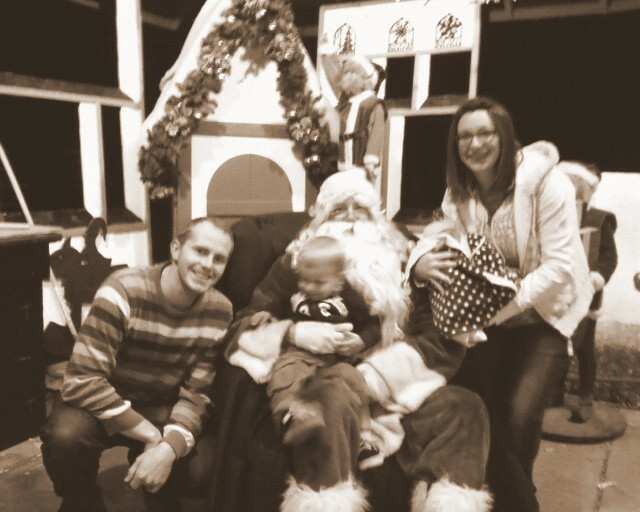 A few days after Atley was born, we took an outing to the Reid Park Zoo to see the lights and Santa. I think this is the very first picture of our entire family together after Atley was born. Atley's first picture with Santa - 4 days old. My mom helped us out and took a picture of our family together while she was still in town. Atley and I getting ready for the picture. And here it is - Hepworth family 2012 - with the newest addition! Love Lincoln's sweet little smile in this one. While my mom was here, she also helped cook, clean, take care of Lincoln, Atley, Squire and me! She also took some cute pictures of her grandkids while they spent some one-on-one time with her. Lincoln visiting Mimi in her room early one morning - wearing the hat she got him. Atley, smiling in her sleep - 4 days old. 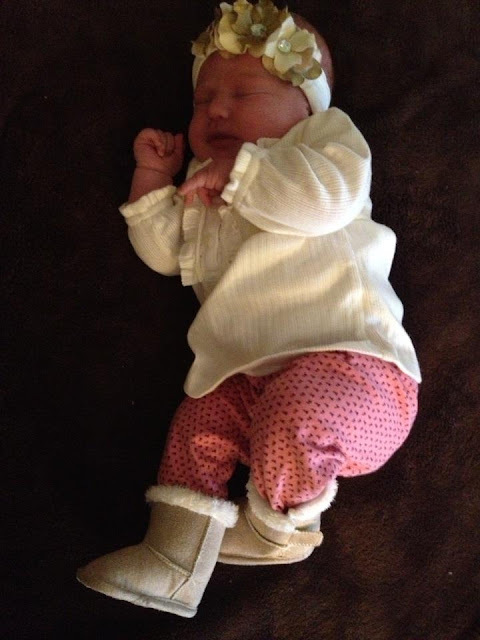 Atley, looking like a sweet little doll - just 5 days old. Mom and I having fun dressing Atley - 5 days old. Here is my sister Mom. :) Yes, this is "Mimi." I hope I look as good as my mom when I'm her age! Pretty much everyone who met my mom, said she could be my sister. For reals. I love my mom so much. 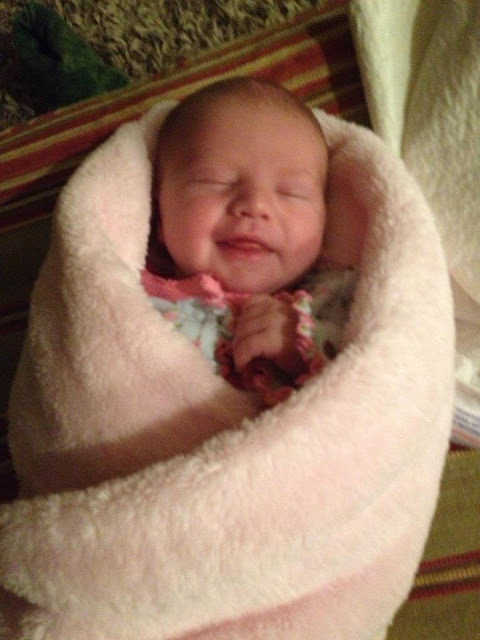 It was so nice to have her help, love, wisdom and sense of humor the week before and the two weeks after I had Atley. When she left, Squire said, "It feels so depressing around here." He called her to let her know that there was "Something important that you forgot that you have to come back to get right now. . ." "What did I forget?" my mom asked him. "Um, you're just going to have to come back to get it . . ." Haha. I felt the same way. We were all sad to see my mom go. We really enjoyed her visiting us. We're glad that with Atley's blessing coming up in just a few more weeks, that we won't have to wait very long to see her again! These are just two pictures of Lincoln I took that I really liked. :) Is my son a handsome little boy or what?! Our Christmas tree this year. Our homemade Christmas tree star. My mom gave us two of our Christmas gifts early this year, so that we could enjoy them this Christmas Season. One, was this beautiful handmade polymer clay nativity set by Emilie Kamachi. Check out her facebook page or website to see more of her work. She is incredibly talented. Mary, Joseph, baby Jesus and Angel. Three awesome bejeweled wise men and one attractive camel. Shepherds, sheep and a donkey with character. The other gift was an ornament for Atley's first Christmas - also by Emilie. Another day. Second attempt, with a gigantic stocking - and success! Sort of . . . But, that ended with the same result. This little girl does not being in stockings. Love this cute picture of her crying though. :) Thanks for the flower, Granny! Lincoln and Atley on Christmas Eve 2012 - in their Christmas jammies. But do you know what we all loved even more?! The fact that Papa Hepworth decided to come down to Tucson to spend a few days - including Christmas - with all of us! :) We had such a nice visit "or "Vist" with Him as he would say. Lincoln loved playing with Grandpa, and Atley was happy to be cuddled in his arms. Lincoln loves cows as much as his cowboy Grandpa does, so they get along very well. Lincoln loved the singing cow, Grandpa brought him that moos to the tune of "Joy to the World," so much so, that the awesome singing cow's batteries had to get lost a couple times during Grandpa's visit. ;) We loved having him come for Christmas, and we hope it isn't the last one he spends with us! All the boys. Lincoln, ready to not be photographed anymore. Proof that were all together at one time! December 26th, 2012 - wishing Grandpa a good trip back to Page. What a fabulous December this one was for our little family! The stillness of our house without family visiting reminds us of how much we loved having them here with us. Atley's blessing day can't come soon enough! We hope your Christmas was filled with as much joy as ours was! And in case you don't hear from me before then - Happy New Year!